The hills and mountains around Long Mountain Lodge abound with places to ride. We can help you fit your ride to your ability. 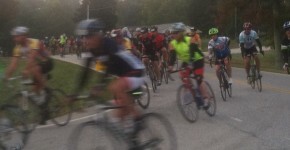 Part of the famous Six Gap Century race is only 4 miles down the road. 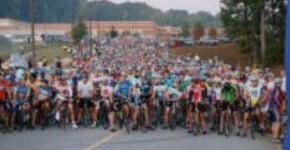 Taking place in Georgia's Premier Cycling Venue, the Six Gap Century & Three Gap Fifty boasts many of the same roads and mountain climbs as the elite Tour de Georgia. Come ride the Ride of the Pros! The Six Gap Century’s ultra challenging route takes you up and down six of the steepest climbs in the North Georgia Mountains. Test your stamina with more than 11,200 feet of vertical climbing over the 104 mile course. Elevations for the six gaps in this ride range from 1,400 feet to 3,460 feet. The toughest climb, Hogpen Gap, will test even the strongest riders, averaging a 7% grade for seven miles, with sections as steep as 15%. 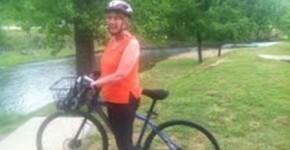 Or, you can take the "Valley Route" Bike Ride. This 35-mile valley option is a great introduction to the infamous Six Gap Century and boasts some of the most scenic mountainside in the Southeast. 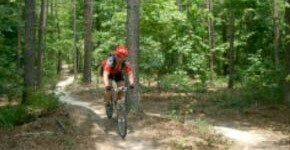 The Chattahoochee National Forest near Dahlonega offers some of the best mountain biking to be found in Georgia. You can drive (or ride your bike as some guests do) 2 or 4 miles to access the national forest roads and the many single tracks that lead from them. Being avid recreational cyclists ourselves, we can direct you to great rides in the region including the Silver Comet Trail and the Greenway.